New wall hanging – with bobbly bits! I’ve been waiting for some wool nepps to arrive. Wool nepps – ‘bobbly bits’! 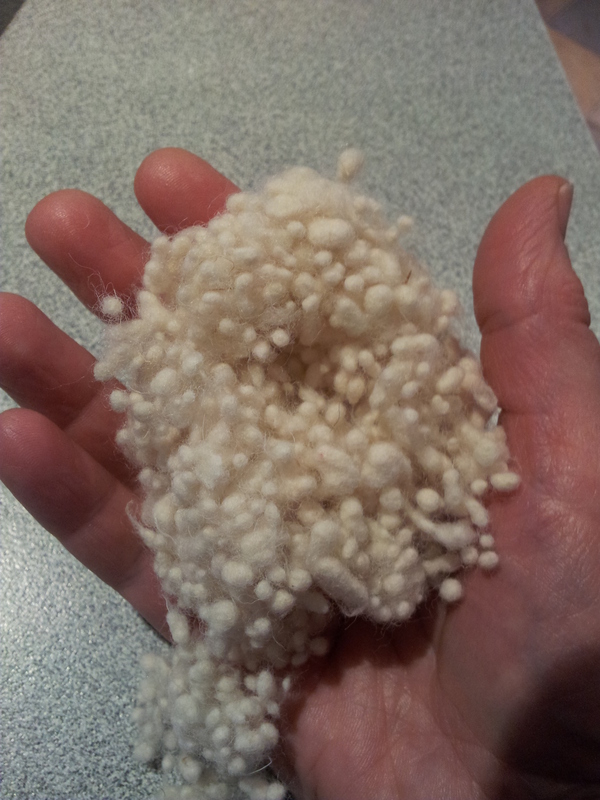 Nepps are round, bobbly bits of wool that can be used in felting. Gawd knows which part of the sheep they come from, but since I saw some on a website I’ve been itching to get my hands on some. As I’d had a while to let my imagination run riot while I was waiting for Canadian and Australia Posts to talk to each other, I came upon a variation on a theme. Another beach, only this time, instead of turning it into a realistic painting, I wanted to make it more impressionistic. What was I going to do with my bobbly bits? When I saw a photo of nepps, they reminded me of the smooth small pebbles I’d enjoyed sitting on when I was at Monaco another lifetime ago. In the felt painting I envisaged, these little nepps would make great closeup grains of sand. I’ve made this one a long, thin wall hanging 27 x 50 cm approximately. It has lovely bright colours that flow from deep blue sky, to turquoise ocean, to yellow sandy beach, to white dunes with sand and some impressions of grass and rock/shell details. The nepps were a little harder to felt than regular wool tops, but I persevered and most of them felted in. I rather like the effect. While I was ordering the nepps, I also ordered three little bags of different coloured Angelina Fibre. This is great stuff and extremely reflective. Less is more with this stuff unless you’re going for a disco look. I added a few strands on top of the white silk tops that highlighted the waves rolling onto the beach. At different angles the light catches the fibre, and it looks like ocean spray sparkling in the sun. Tiny threads of angelina fibre on top of the silk tops, to create ‘ocean spray’ effect. So, here it is, and I’m very happy with the result. I like the longer thinner shape of this one. I think the colours work well, and there’s enough detail to make it interesting without overdoing it… keeping it simple. It is a style I will use again. 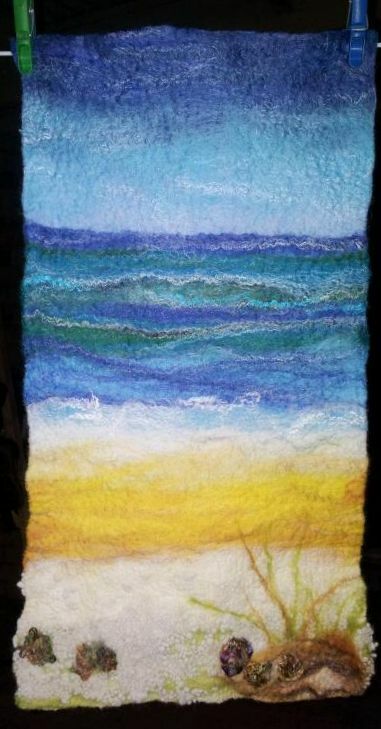 I have another piece of felt batt that I used as my ‘canvas’, so I want to make another wall hanging in a similar impressionistic style. Not sure yet whether to do another beach scene, so I have a diptych, or a different theme altogether. Whenever I’ve used wool nepps they never seem to felt in as much as I’d like them to. I might have to take them off one of my nuno felted scarves (they are barely attached) or someone wearing it may look like they have a bad case of dandruff. The nepps are ideal for your beach though. I suppose you need enough wool behind them to hold them in place, and I added mine as an afterthought. Will try a beach scene next after I’ve finished playing around with dyes. I agree that the longer thinner shape looks good. Yes, I was wondering how to attach them easier next time. I did have four layers of wool, behind them, so I might try the barest minimum of unbleached rovings over the top, just a few whisps and see if that makes a difference. Get the glue effect without it being obvious.